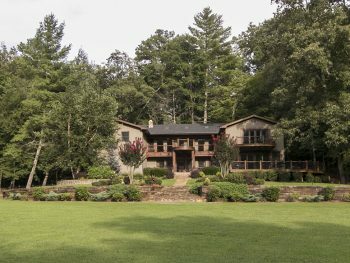 Situated just an hour and a half north of Atlanta near Blue Ridge in the North Georgia Mountains, Laughing Bear Lodge is an ideal location for your company’s next business retreat, staff meeting, church retreat, or family vacation. 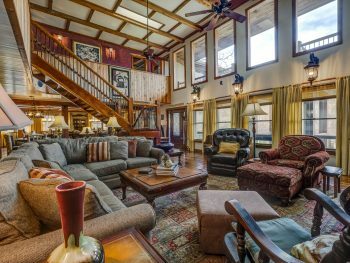 With room to comfortably sleep up to 40 overnight guests (20 individual beds and 4 sleeper sofas), this luxurious lodge near Blue Ridge, Georgia is a perfect setting for a variety of events from a corporate team-building program or church retreat, to a family reunion where there’s something for everyone of all ages. Main Level: Full Bathroom is wheelchair accessible and ADA compliant. Upper Level: Bedroom #6 has expanded to have 2 queen beds and is no longer be inside Bedroom #5. Bedroom #5 also has 2 queen beds. Planning a family reunion or gathering can be a stressful experience. Making everyone happy is no easy task and you want to make sure everyone of all ages will have plenty to do. 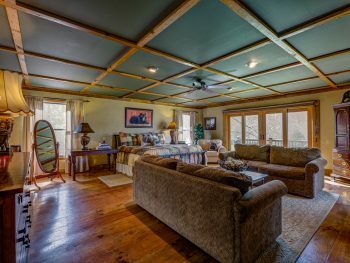 If you’re searching for the best North Georgia mountain rental to host your family reunion or vacation, look no further. 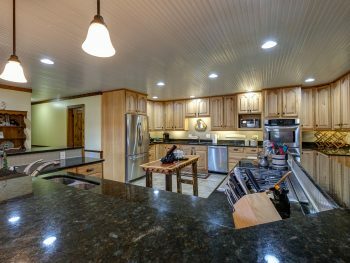 At Laughing Bear Lodge, located on a bubbling trout river and tucked away in Blue Ridge, GA, you can make your next family vacation truly unforgettable by reserving this luxury rental today! To learn more about the ideal spot for your next family reunion or corporate retreat, call Leslee at 706-492-3311 or email us, too. Our stay could not have been better. The accommodations were 5 star. The kids & grandkids could not say enough of all the activities that were on hand. We just had a spectacular family reunion here. There were 26 of us ranging from age 74 to 3 months. 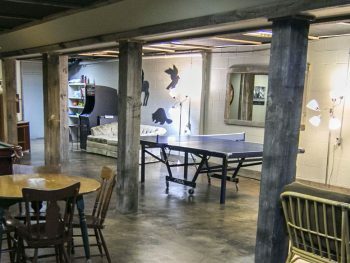 The game room and indoor basketball court were real hits with both the kids & adults. We were thrilled to have our cousin reunion at Laughing Bear Lodge in September 2016! Beautiful home, spacious, everything we could have asked for. Our only regret was that we couldn't stay longer! Thank you! A beautiful place for small or very large groups. There are many fun things to keep you busy, but also such a beautiful setting to just relax and unwind. I highly recommend this wonderful place! One of the most beautiful places I have stayed. It's been wonderful to feel the warmth of this place! We visited with four generations of family in attendance and found everything about our experience to be wonderful...Our family made some lifelong memories and we hope to someday to return to Laughing Bear and make some more. We had a group of 27 from ages 4 months to 81 and we all had a great time. There was so much for the kids to do in the basement, they were never bored. They thought of everything! We enjoyed our time at LBL. My girls especially loved playing the creek. We had a fantastic time at the Lodge. So much so, that we might be back next year! And, possibly, add another day to the stay. Copyright © 2019. Terms & Conditions Website Design Services and Search Engine Friendly Web Design by SEO Advantage, Inc.
Rustic and luxurious North Georgia vacation easily accommodates large gatherings for family reunions, church groups and many more. Convenient location is close to various attractions in North Georgia such as Ocoee Olympic Center, Brasstown Valley Resort, Blue Ridge Scenic Railway, Aska Adventure Area, Amicalola Falls, Appalachian Trail, Lake Blue Ridge, Toccoa River, Carters Lake, Hiawassee Lake, North Georgia trout streams, whitewater rafting and more.